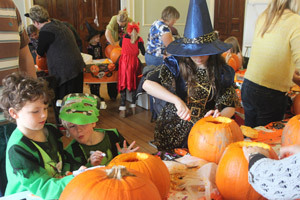 A SPOOK-TACULAR display of pumpkins filled Tedworth House last week as children of the wounded, injured and sick serving personnel and veterans were invited to the House to take part in a pumpkin carving workshop. Their imaginations, clearly inspired by their fancy dress costumes, were running wild and they carved up some very spooky faces. From toothy grins to scary scowls, there was a huge range of creations! The morning was organised by the Band of Brothers and Band of Sisters team who offer lifelong support to men and women, along with their families, who have sustained life-changing injuries during service. Recognising how important it is for families to spend time together in a relaxed and caring environment, these workshops also offer Band of Brothers and Band of Sisters members the opportunity to meet families who have gone through the same experiences.